The land of Etheria has fallen to turmoil with the arrival of the armies of the Old Ones. It's up to you, and your allies to stand your ground, defend, and push them back! Dungeon Defenders 2 seamlessly combines major elements from tower defense, role-playing, action, and strategy games. Create your set of heroes, and actively participate in battle, while decimating enemy forces with various towers you can deploy and deadly abilities you can use. Collect loot and treasures from various maps to improve your hero's gear. Defeat as many enemies and complete missions to earn EXP and level up your hero! Welcome to Supercheat's unofficial guide to the sequel of the highly acclaimed action-strategy title by Trendy Entertainment. Please use the menu on the right to navigate the guide. 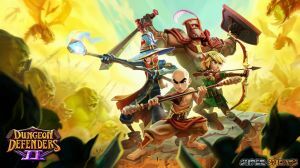 No discussions open for Dungeon Defenders II at the moment.